Click on any question below or click here to show all answers or to hide all answers. Can the camper be used on and off the pickup? Yes it can. Demountables are designed to be used on or off their base vehicle with all of their facilities and services being fully functional in either situation. However, having raised the camping unit to a maximum height in order to drive the pickup out from beneath it, it is normally necessary to lower it again to a more stable position nearer the ground before using it. What happens to the demountable's legs while travelling? On many north American campers, particularly the larger models, the jacking legs are permanently fixed in their vertical locations at the sides and rear of the vehicle. For travel they are simply wound up as far as possible but are left in place. Among European demountables the legs are more commonly designed to be removed for travel (and stored inside the camper) or to be folded up out of the way. How does having the camper on the back affect the driving? To a considerable extent this depends on how well the camper and pickup are matched (See matching the camper to the pickup) but obviously the combination will be heavier and will have a higher centre of gravity than the pickup alone. This will inevitably be felt in the way the combination drives, with an impact on acceleration and braking times and with a tendency to roll on roundabouts and tight corners. This tendency can be limited, if necessary, by the fitting of assisted suspension. Careful packing, as low and as far forward as possible, can help to minimise the effect. A demountable unit that is properly fitted and secured will not be able to move about in the pickup bed. How long does it take to mount/demount the camper? Only a few moments if you believe the manufacturers - a little longer in the real world! It varies, of course, depending upon the jacking system (electric jacks are quicker than manual jacks), the number of legs (some units have three, some four), the complexity of the demountable's tie-down system, the lie of the land, your experience, and luck (sometimes you just don't get it right). Demounting is usually fairly quick because all you have to do is lift the camper off the pickup and drive away. Mounting tends to take longer because you have to get the pickup aligned as perfectly as possible before lowering the camper onto it. My own demountable has very slow manual jacks on four legs, and four tie-downs to do up or undo - demounting usually takes about 30 minutes, mounting perhaps more than twice that. Will any demountable fit any pickup? The short answer is 'No'. The first consideration has to be weight - the weight of the demountable unit (plus an allowance for people, water, gas, clothing, equipment, etc.) has to be within the payload capacity of the pickup. The next obvious consideration is length - pickups come with cargo beds of different lengths and there are demountables on the market designed to fit all of them. Beyond that there are several other dimensions and considerations which have to be taken into account to be sure of a safe and secure fit of one to the other. See the article 'A Choice Of One' on the matching the camper to the pickup page for full details. Does a pickup have to be modified to carry a demountable? Normally 'Yes', but the extent of the modification can vary enormously. 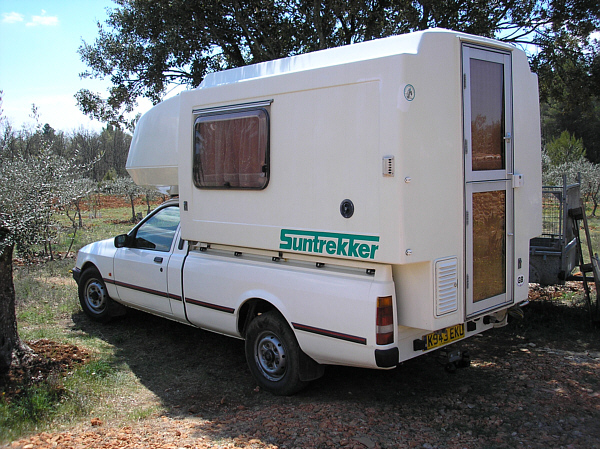 Island Plastics' Suntrekker in the early 1990's, for example, simply required the removal of the tailgate in order to fit it to the contemporary Ford P100. In contrast, fitting the Bimobil Husky 'pickup system' involves a complete rebuild of the rear end of the vehicle. The most common modifications, for fitting a European-sized demountable, are the removal of the tailgate and the fitting of four eyebolts through reinforced sections of the pickup bed. How easy is it to get insurance cover? It is not a major problem but you won't get too much choice and, as always with insurance, it's a matter of shopping around, reading the small print and asking lots of questions until you're happy. The pickup can be covered by regular motor insurance and the camper and contents can be covered by regular caravan insurance BUT you do need to make sure that the insurance company is aware that the camper is carried, not towed, and that the cover of both parts is unaffected by that. You can find much more information on the demountable insurance page. Does the ground need to be level to demount the camper? It's not essential but it certainly makes the job a whole lot easier if it is, particularly when it comes to re-mounting it. Having said that, it matters much less if the slope is front-to-back than it does if it is side-to-side. If the ground is very uneven or slopes significantly from one side to the other it becomes extremely difficult to accurately position the pickup and to get the demountable to lower squarely and centrally onto it. Can passengers travel in the demountable? The simple answer is 'No'. The registered vehicle, i.e. the pickup, will have a designated number of seats. (In the UK this number is specified in the V5 registration document.) It is illegal to carry passengers anywhere other than in those seats so, for example, it is not legal to carry people sitting in the pickup bed - or sitting in a box in the pickup bed, which is what a demountable camper is after all. By the same token, in the case of a van, it is not legal to carry people in the back of the van unless it has been fitted with securely-mounted seats, the registration authority has been notified, and the vehicle's registration document has been changed accordingly. This is the basis upon which passengers are able to travel in the back of other kinds of motorhome. Where is the best place to look for a second-hand demountable? The supply of second-hand demountables in the UK is extremely limited reflecting the very small sales of new units. It's worth regularly checking the stocklist of motorcaravan/caravan dealers (they may have taken one in in part-exchange). Private classified ad's in the motorcaravan press are probably the best bet but, as ever, it's a matter of looking in the right place at the right time. Increasingly eBay offers possibilities if you have internet access and are happy to use it. If that is the case, and if you're looking for a specific model, you can cover all of the above and more by typing the model name into Google, or your preferred search engine. (Put the name in quotes, e.g. "Island Plastics Suntrekker", to restrict the search to exactly that phrase and avoid irrelevant links.) Wherever you look though you are not going to be spoiled for choice. If you find exactly what you are looking for, you will have been very lucky. I'd like to try one. Can I hire a demountable camper and pickup anywhere? 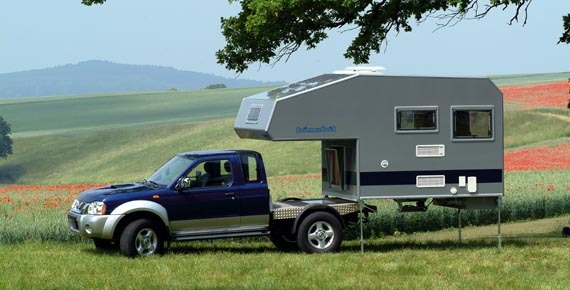 There are very few companies in Europe that hire out demountable campers and pickups. Some that do are companies that specialise in camper or motorhome rental, others are camper manufacturers who offer the opportunity to hire their product, probably in the hope of securing a later sale. Of these, a number only offer the camper unit for hire so it is necessary that you already have a suitable pickup equipped with appropriate tie-down fixtures and towing electrics. You can find more details on the european demountable hire page of this website. How can I find out more about demountables? If you've exhausted the information offered by this site try exploring some of the linked sites in the manufacturers/importers and e-zines and information page. Frequently asked questions about demountable campers. At the moment this is just a random list of common questions about demountables. In due course if the list gets long enough I will sort and categorise them. In the meantime, click on any question to see the answer or, if you prefer simply to browse, click on 'show all answers' at the top of the page and scroll down.